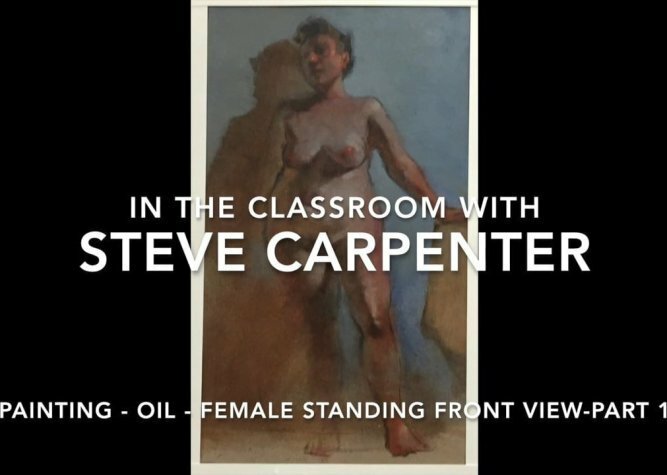 This oil painting lesson begins with a burnt umber drawing of the figure with definitive line playing a critical role. Emphasis on finding pattern, beauty in negative forms, and orchestrating cast shadow are important themes in this stage of the oil painting. As part of the design Steve works toward creating a rhythm with dark and light passages. In part 2 Steve continues to refine movement and pattern in the oil painting. The background is addressed and details in the figure and portrait are finalized. Dark and light values and the use of warm and cool color is discussed.